Do you love the National Western Stock Show? If so, here's a great offer. 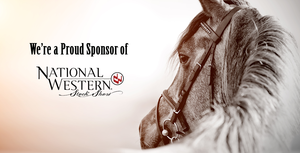 Purchase a $10 Powerball or $10 Lucky for Life ticket (must be on one ticket), and you'll get a voucher for a Buy One, Get One Free National Western Stock Show event ticket. That's a great deal for the Pro Rodeo, Dancing Horses or Xtreme Dogs events held January 22-24, so don't delay - if the events sell out, you miss the deal! Offer good beginning December 3rd through January 23rd at Lottery retailers. Vouchers must be redeemed at the National Western Stock Show box office. The voucher doesn't have any cash value. Restrictions apply.